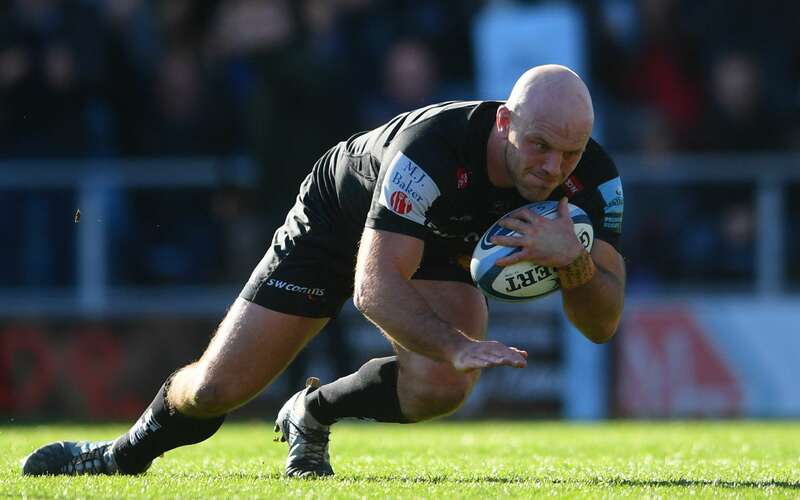 It’s become somewhat of an annual jaunt for Exeter Chiefs supporters in recent years, but the Devonians will again find themselves just one game away from returning to English Rugby’s HQ. Rob Baxter’s side confirmed their place in the Gallagher Premiership play-offs for a fourth successive season, courtesy of this latest bonus point victory over local rivals Bath at Sandy Park. However, the fact they’ve achieved the feat with five rounds of battle still to go, merely underlines the way in which the Chiefs have gone about their business once again this season. Although not quite at their sparkling best, the home side still had too much fizz for Todd Blackadder’s side, who had offered a decent resistance in the first half, recording a try through prop Nathan Catt and five points from the boot of Welsh fly-half Rhys Priestland. Those were the highlights for the visitors, who despite dominating large parts of possession, could not cope with Exeter’s all-court game, which yielded tries for Ollie Devoto, Jack Yeandle, Olly Woodburn, as well as a second half penalty try. Joe Simmonds, drafted in at the warm-up after Gareth Steenson tweaked a calf, weighed in with the remainder of the points. Having seen their lead at the summit cut overnight by defending champions Saracens, following their victory over Harlequins at the London Stadium, the Chiefs took to the field buoyed by the return of their international contingent following the recent Six Nations Championship. Baxter, though, recalled just two of his star names for his latest engagement, Henry Slade and Jack Nowell coming into the back division from those that had started against Worcester Warriors last time out. Bath, meanwhile, were boosted by the return of England powerhouse Joe Cokanasiga on the left wing, as well as Springbok forward Francois Louw and Wales and British Lions centre Jamie Roberts. There was also a starting role for former Chief Will Chudley at scrum-half. And early on it was the visitors who set the attacking tone, former England Sevens star Ruairdh McConnochie fashioned the first chance of the game with a lung-busting burst from deep, which enabled the visitors to get decent front foot ball, deep inside the Exeter 22. Although the Chiefs soaked up the initial threat well, it was in the ensuing play that Bath yielded their first reward through Priestland, Exeter No.8 Matt Kvesic penalised for not rolling away. Visiting cheers proved short-lived as within four minutes parity was restored. Simmonds slotted his first points of the contest when he drilled over a similar shot at the target after referee Karl Dickson had pulled up Bath for again not rolling away. Up and running, the Chiefs were quickly back on the offensive, a slick handling move involving Simmonds, Slade and Santiago Cordero helped to release Woodburn down the left at a rate of knots. The former Bath flyer powered his way through one tackle, then another, before crawling his way to the try-line for the score. The officials were unsure as to the validity of the score, so referred the matter to the TV match official. Numerous replays ensued, before it was deemed Woodburn had in fact been tackled in the build-up and had failed to release possession. End outcome, no try! Bath duly made the most of the let-off, tearing down field themselves to create the opening for the game’s first try on 15 minutes. Jonathan Joseph and Tom Ellis created the mayhem, only for the latter to be halted by some decent covering defending from Cordero. However, the cavalry was close at hand and following a succession of close-hand raids, it was Catt who burrowed over for the converted score. Although behind, the Chiefs did not seem too bothered with how the game was faring. Instead, they clicked back into gear and by the break were nicely up and running. Cordero threatened with one magical run through the middle, before Nowell broke in off the right flank to feed Simmonds, whose clever ‘show and go’ created the opening for Devoto to power over against his former employers. Simmonds slotted the extras to that score, but was narrowly wide with his next kick for Exeter’s second try. Heavy duty work from Messrs Slade, Dennis and Ewers laid the foundations from which Armand was able to cleverly switch play back into the path of Yeandle, who needed no second invitation to cruise his way over for the score. Seven points clear as the game headed towards the interval, Bath looked to summon a response through Cokanasiga, then the industrious Zach Mercer, but on both occasions the Chiefs held firm. Now with the stiff breeze at their backs, the Chiefs started the second period brightly. The marauding Exeter pack helped to position them deep behind enemy lines in the initial exchanges, but just as they looked set to pounce, England international Harry Williams knocked on with the try-line in sight. At the other end, Bath lock Charlie Ewels – himself back from life with England in the Six Nations – found himself with time and space deep in the Chiefs 22, but Cordero was able to provide a more than efficient speed hump, which enabled his colleagues to scramble sufficiently before winning a turnover penalty. Bath, though, had the bit between their teeth and they continued to push forward, looking for a score to put them back on terms. They declined a kickable penalty for greater reward from a five-metre line-out, but the Chiefs held their nerve in defence, eventually doing enough to clear the danger. Threat averted, the Chiefs turned to their fresh stock on the bench. Luke Cowan-Dickie and Grand Slam winner Tomas Francis were both introduced on the hour mark – and the duo’s first contribution was to win their side a penalty try. Together with Alec Hepburn, the trio destroyed the Bath front-row to such an extent that Dickson had little option but to go under the posts. To make matter worse for the visitors, replacement prop Beno Obano saw yellow for his part in the subsequent collapse. With the man advantage and a bonus point in sight, the Chiefs looked to turn the screw in the final quarter. A lovely burst from man of the match Simmonds saw him fizz a pass to Woodburn out wide, but on this occasion the winger could not quite stay in field and the chance was spurned. Woodburn, however, would not be denied and with four minutes remaining, the Chiefs grabbed their fourth try of the game. Seizing on a loose cross-field kick from Freddie Burns, Sam Hill mopped up the loose ball, he charged down field and following a succession of phase play moves, it was Woodburn who was on hand to add the finishing touches. Job done and with the Tribe in full voice, the Chiefs could have added another score in the final minute, but this time Woodburn was unable to provide the scoring pass inside to a team-mate, butchering what would have been a certain try for Jack Maunder. It mattered not in the grand scheme of things. Instead, the Chiefs can now look forward, knowing with five rounds to go, they can once again set their sights on Twickenham and a place in the end of season showpiece. Exeter Chiefs: S Cordero; J Nowell (T O’Flaherty 55-63, 74), H Slade, O Devoto (S Hill 66), O Woodburn; J Simmonds, N White (J Maunder 76); A Hepburn (B Keast 63), J Yeandle (capt, L Cowan-Dickie 60), H Williams (T Francis 60); D Dennis (M Lees 49), J Hill; D Ewers (D Armand 73), D Armand (S Skinner 66), M Kvesic. Bath Rugby: T Homer; J Cokanasiga, J Joseph, J Roberts (M Clark 51); R McConnochie; R Priestland (F Burns 68), W Chudley (capt, K Fotuali’I 60); N Catt (B Obano 54), T Dunn (J Walker 65), H Thomas (A Perenise 12); E Stooke, C Ewels; T Ellis, F Louw (L Douglas 66), Z Mercer (S Underhill 55).